Anne Russinof - "Serpentine Four ", gestural abstract aquatint print, shades of blue and violet. Anne Russinof - "Serpentine 12", gestural abstract monoprint, layered blue violet, green. 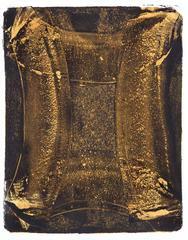 Anne Russinof - "Serpentine Nine", gestural abstract aquatint monoprint, raw umber, turquoise. 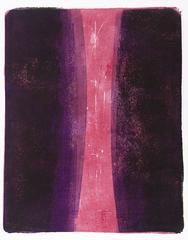 Anne Russinof - "Thick and Thin Six", gestural abstract aquatint print, violet, silver, green. Anne Russinof - "Serpentine 11", gestural abstract aquatint monotype, green, blue, turquoise. 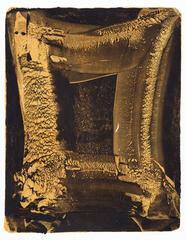 Anne Russinof - "Broad Strokes Seven", gestural abstract aquatint print, layered silver, yellow. Broad Strokes Nine, gestural abstract aquatint print, ultramarine blue, silver. "Broad Strokes 9" is a rich, gestural abstract monoprint made with multiple etched sugar lift, white ground and aquatinted copper plates. Printed in ultramarine blue and metallic silver on 100% archival cotton rag paper, signed by the artist in pencil on lower right corner. The image size is 14" x 12". Anne Russinof lives and works in Brooklyn, NY. Originally from Chicago, she is a graduate of the School of the Art Institute of Chicago and received an MFA from Pratt Institute. Printmaking was an early focus for Russinof, who is now primarily an oil painter with a studio in Crown Heights, Brooklyn. All of Russinof’s work is tied together by a focus on gestural line as expressed in layers of color. Russinof has been a resident at the Yaddo and Millay Art Colonies, exhibits primarily in the New York area, and is a member of American Abstract Artists. Supporting herself as a designer for print and web, she also maintains a blog called Gallery Travels that features mostly abstract painting shown in NYC. "Serpentine 12", gestural abstract monoprint, layered blue violet, green.